Improvements: HOV lane, one mixed-flow lane in each direction, interchange modifications at San Antonio Dr. undercrossing, Imperial Highway undercrossing, Pioneer Boulevard undercrossing, and Orr and Day Road. The new Imperial Highway on ramp to northbound I-5 is open. The new Imperial Highway off ramp from southbound I-5 is open. The new San Antonio Dr. on ramp to southbound I-5 is open. San Antonio Bridge: Construction complete. Imperial Highway Bridge: Construction complete. The Pioneer Blvd. 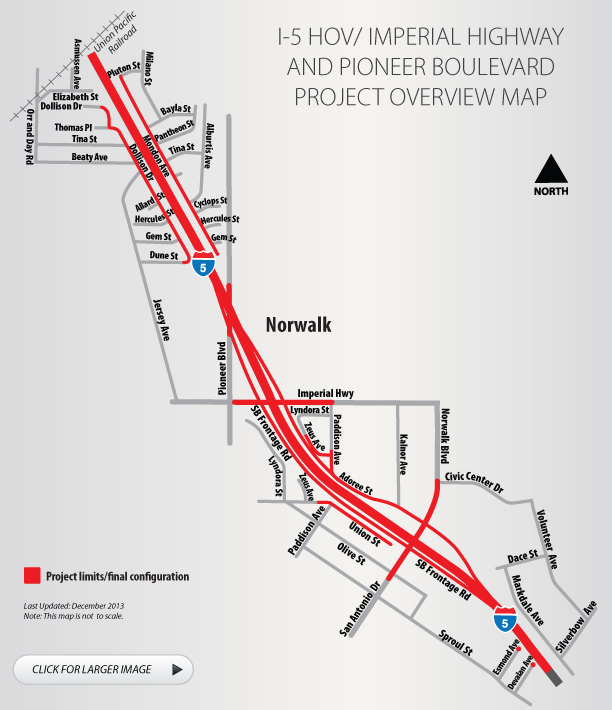 on ramp to northbound I-5 is permanently closed to allow the addition of lanes to northbound I-5.